I've been meaning to post this up. Chelsey forwarded this to my attention. 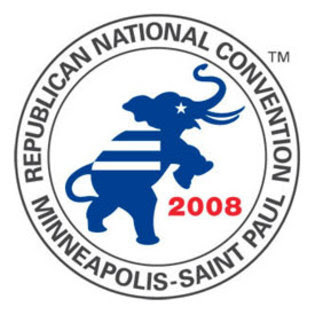 This is the logo for the Republican National Convention here in Minnesota. Is it just me or does it look like the elephant is having relations with 2008? At the very least it looks like the republicans are looking forward to crushing 2008 with their out of control elephant just like they have screwed with our civil liberties and crushed our dignity and reputation in the world. I think the logo is perfect except that it lacks a slogan such as "The search for WMD's will continue!" or "Iran 08!" Definitely looks like it's on a rampage.